In the meantime, below is a preview of the preface to the second book, entitled The Great Suppression of American Alternative Medicine. We the people will take it no more. We will no longer listen to your propaganda or suffer from chronic disease, for which there have been cures known for decades. Nor will we tolerate those who are willing to maim and kill us, and especially those who knowingly and deliberately harm our children; injuring their brains for the rest of their lives in order to sell their wares. The world population is about to find out about what you are doing and how long you have been doing it. Having more money than God won’t save you, after the masses know what we know. Be afraid. Be very afraid. The downfall of Big Pharma isn’t going to take a government edict, action of congress, or the attention of the President of the United States. People simply have to read the VITAMIN C CURES book series in order to learn the truth. 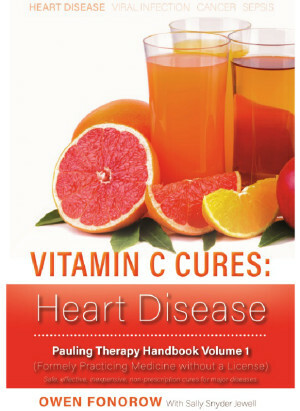 After one person reads VITAMIN C CURES: Heart Disease, that person will know. As more people read the series, more people will know. Every new reader of the book reduces the power of Big Pharma. At some point, enough people will have enough knowledge and truth to cause Big Pharma and the people who promote its Big Lie to dwindle into the ashes of history. Every reader of VITAMIN C CURES decreases the power of Big Pharma’s mind and body control over humanity. If you are reading this, there is a good chance that it is due to the tireless efforts of American’s #1 Health Freedom fighter, Tim Bolen. Tim is a strong voice for truth and freedom. An American hero, his web site, the BolenReport.com, has a rather large audience; thanks to the mandatory vaccination law in California. Tim’s web site has become a source for various alternative media, and he has the ear of top members of the new administration. But the beauty, perhaps the divine inspiration, is that we the people don’t need much help from any government. As long as the book exists, and can be downloaded and read by all people, governments can sit back and watch. The people will take care of what needs to be done, and they will ferret out the nefarious individuals behind this; no matter how rich and powerful they are at the present time. I used to think we’d need a law to ban pharmaceutical advertising, to break the “70% of revenues” stranglehold that Big Pharma’s ads have over the mainstream media. After what’s coming, Big Pharma won’t have any money to advertise. The problem will take care of itself. Of course, the federal law classifying foods as drugs needs to change; but again, after people know, the public will demand that the law change. Please sign our petition to change the law in order to make a drug a drug, and a vitamin a vitamin. Note: We are asking Erin Elizabeth (HealthNutNews.com) for permission to copy her 38 synopses of the strange deaths of alternative doctors since 2015. As reported by Erin Elizabeth on HealthNutNews.com, more than 60 leading alternative doctors have met their ultimate demise since early 2015. Some of these deaths are most likely from natural causes, however others seem far more suspicious. Perhaps the most questionable is the death of anti-vaccine doctor Jeffrey Bradstreet, who was murdered shortly after federal officials raided his premises. A most disturbing theory suggests that the murders are the work of a rouge element, or death squad, that operates within the United States government.